Perhaps some opening day jitters for both sides as despite scoring in every single one of their qualifying matches, Poland was held to a clean-sheet by Northern Ireland, who were unable to find the net themselves in their first Euro match. Very few issues for the defending World Cup champions Germany out of the gate against Ukraine as they take a one goal lead inside 3 minutes with a goal from Real Madrid midfielder Toni Kroos from outside the box. As expected, the Germans dominated both possession time and chances on goal and would go on to score once more before the half with Thomas Müller netting his first of the tourney. Ukraine showed life in the second half however scoring twice on either side of Bastian Schweinsteiger's 65th minute goal; Ukraine's tallies came via Stuttgart striker Artem Kravets and Sevilla winger Yevhen Konoplyanka to make the score seem a lot closer than the match actually was. After managing two goals against Germany, Ukraine became Northern Ireland's second clean-sheet victim as in the second competitive match for the debutants the final result was scoreless. After dismissing Ukraine in a dominant performance, the Germans were once more the visibly much better side against Poland. With Poland's inability to score for a second match in a row, Mesut Özil's only goal of the contest was enough to hand the Germans another victory. If you thought that Northern Ireland were keeping their goal-scoring talents to their last match after their initial consecutive 0-0 draws against Poland and Ukraine, that was not the case at all. In yet another strong performance the Germans dominated the Northern Irish from start to finish as first -half goals from Mesut Özil and Thomas Müller pretty much sealed the deal. Another from Müller in the second half likely spelled the end of Northern Ireland's first Euro tournament, with the debutants finishing on 2 points, but without a single goal scored. Probably the biggest match for either side in the group stages, the meeting between the two co-hosts of the 2012 Euro tournament was always seen as Group C's crucial head-to-head for second place; and so it plays out. 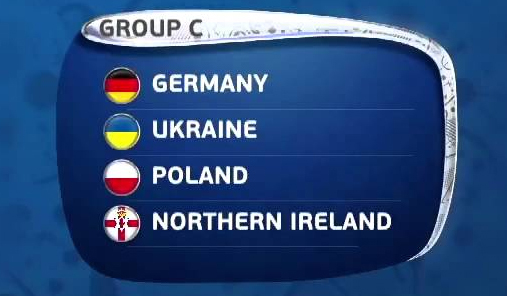 A draw would see both Poland, Ukraine and Northern Ireland tied on 2 points (considering we know Germany defeated Northern Ireland 3-0, although the matches are being played simultaneously), with Ukraine finishing 2nd, Poland in 3rd and Northern Ireland in last place in the group due to Ukraine's superior goal differential / goals scored record. In what was a fairly even match throughout with Poland having a few more chances on goal, it was Ukraine to score the first of the match; Yevhen Konoplyanka scoring his second of the tournament in the 23rd minute. But just 10 minutes after Ukraine's goal, a Polish side that were held scoreless in both of their first two matches were on the board at last with a tap in from none other than Robert Lewandowski. In the second half Ukraine scored once more, as central defender Yevhen Khacheridi scored with his head on a corner-kick for the "yellow and blue"; a goal that would remain the match-winner and send the Ukrainians through to the next round, while leaving Poland at the basement of Group C.
Perhaps the biggest shock in Group C is Poland's poor scoring performance which in turn handed them the last place in the group. Germany's dominance was anything but a surprise, while Ukraine's 2nd place had already confirmed a quarter-final match between Ukrain and Albania. Northern Ireland finish in 3rd place, but their -3 goal differential along with only 2 points earned is not likely to be enough for a quarter-final spot as one of the best four 3rd place teams.